With only a few hectic weeks remaining in 2017, we wanted to take a moment to reflect on a remarkably positive year in which the bank experienced growth, milestones, accolades, opportunities and the celebration of relationships – both old and new. The year kicked off with big news when, on January 3rd, TCPalm, a member of the USA Today Network, reported: Vero Beach-based Marine Bank & Trust saw double-digit growth (21.9%) in the past fiscal year. That kicked our year off with tremendous momentum that Team Marine kept going the entire year. 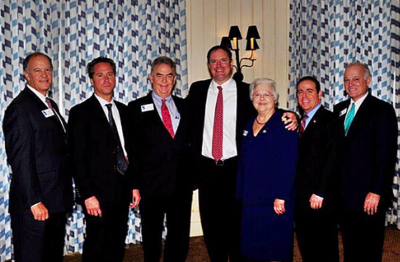 As a community bank, we continued to organize and support events that brought people together such as our Chairman’s Luncheons, the Vero Beach Prayer Breakfast, the Sebastian River Area Chamber of Commerce and the Indian River Chamber of Commerce’s networking events. We also supported organizations and programs that enhanced the quality of life in our community including the Indian River Habitat for Humanity, Pelican Island Audubon Society, The Emerson Center’s Humanities Series, and The Riverside Theatre’s KidSpot. For the fifth consecutive year, we supported the Indian River County Chamber of Commerce's Leadership program by providing a minority scholarship. This year's recipient was David Myers of D. Myers & Associates Mortgage Consulting. Jessica Francis and Jo-Ann Copeland demonstrated their commitment to the long-term benefit of our community by graduating from the program as well. 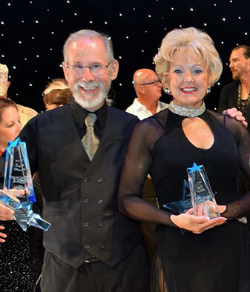 In May, Georgia Irish showed off her dancing and fundraising skills by participating in Dancing with Vero’s Stars, a fundraiser for the Indian River County Healthy Start Coalition whose mission is to improve maternal and infant health in our own community. Although she did not take home the top trophy, Georgia was certainly a star in our eyes. In August, Bill Penney, Mary Cone, Georgia Irish, and Kim Prado were named the campaign Chairmen for the 2017-2018 Annual Campaign for the United Way of Indian River County. Although they are the chairs, everyone on Team Maine will be involved. Our commercial lending team continued to be a reliable capital resource for local business. A few examples of Marine Bank financing at work in our community include the construction of Christ Church Vero Beach and the office of Vero Beach Neurology and Research Institute, and the brewery equipment for the Sailfish Brewing Company. In June, Bill Koehne joined the Bank as Senior Vice President, Commercial Lending and, soon after, we opened a loan production office in Brevard County. Our residential lending team hosted two informative breakfast seminars for local realtors. The March event’s presentation “The Luxury Home Market and the Trump Administration’s Impact on the Residential Market” was delivered by Gary B. Smith of Fox Business News. The November event’s presentation “2018 Interest Rates and the Luxury Home Market” was delivered by Tom Essaye of The Sevens Report. Both were well received by the scores or realtors in attendance. In May, Stephen D. Shields joined the bank as senior vice president, residential lending manager. In May, we launched our new website which was designed for optimum viewing on desktop, tablets and smart phone for a better user experience. We also added a blog featuring useful financial news, fraud prevention tips, and housing advice. More customers began to enjoy the convenience provided by our mobile banking app which enables them to deposit checks, transfer funds, pay bills, and more - all from their mobile device. Our surcharge-free ATM network expanded to include Speedway and, thanks to eStatements, customers can securely access their account statements online. In July, we officially turned 20 years old. The Bank invited local students to help commemorate the milestone by participating in an essay contest. Students wrote about what they envisioned their lives to be like when they are 20 years old, how much everyday life has changed since 1997, and what life will be like twenty years from now. Prizes were awarded to students at the elementary, middle and high school levels. Teachers of the winning students also won gift cards for classroom supplies. Our social media pages touted events from 1997 such as Tiger Woods being the youngest person to win the Masters, the launch of DVD technology, and the Dow Jones crossing the 7,000 mark. 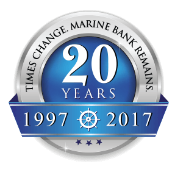 By illustrating how much times change, Marine Bank’s longevity was highlighted. We also celebrated two of our original employees, Mary Cone and Karen Clothier who have been with the bank before the doors were even opened. Mary would go on to be named the Affiliate of the Year by the Realtors Association of Indian River County for the second time! Mary, the only two-time winner, was recognized for her commitment to the organization and her continued service to our community. Team Marine would go on to garner much more recognition. 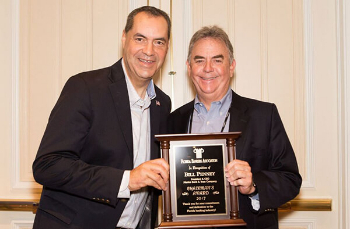 In June, our President and CEO Bill Penney was presented with the 2017 Chairman’s Award by the Florida Bankers Association (FBA) for his continuous support of the association, his leadership on FBA committees, and his commitment to the success of the banking industry. In July, our commercial loan office Daniel Fourmont was named President of the Rotary Club of Vero Beach and Vice President and Branch Manager Kim Prado was named Florida District President-Elect of the Florida District Exchange Clubs. In September, Hurricane Irma paid us a visit and Bill Penney’s commitment to following a continuity plan and employee safety was featured in an American Banker article soon after. 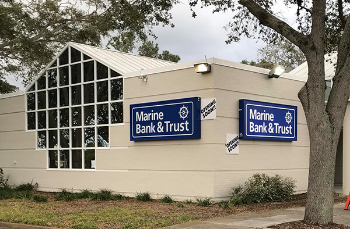 In November, The Sebastian River Area Chamber of Commerce awarded Marine Bank with its 2017 Chairman’s Award for the Bank’s commitment to the success of the community, its residents and businesses. In December, our entry in the Oceanside Business Association’s Christmas Parade took home the trophy for “Most Enthusiastic.” We continued to show our holiday spirit as Mariner Pete and his elves were on hand to welcome Santa to the Indian River Mall and our Sebastian Beach banking center was decorated to the nines for the Sebastian Area Chamber’s Light the Night event. As we celebrate this holiday season, Team Marine has a lot to be joyful about. And, as 2018 approaches, we have good reason to expect a year of even greater opportunities and achievements. In the first quarter, we will open our fourth full-service banking center, our first in Brevard County, at 3303 Suntree Boulevard in Melbourne. The banking center will be managed by Vice President Malak Hammad. Joining Malak will be Assistant Banking Center Manager Charles N. McCoach, Senior Vice President and Commercial Lending Manager Bill Koehne, and residential lender Ryan Lees. Thank you for revisiting 2017 with us. We hope your 2017 was equally fulfilling and your 2018 has an abundance of opportunity!